Last post we showed the successful attempt to get a good enough alignment that the goto scope capability could get Neptune in the camera field of view. We were quite excited about this success, but as usual the amateur should follow up with some analysis to confirm that the object identified is really the target in question, in this case, is Neptune. 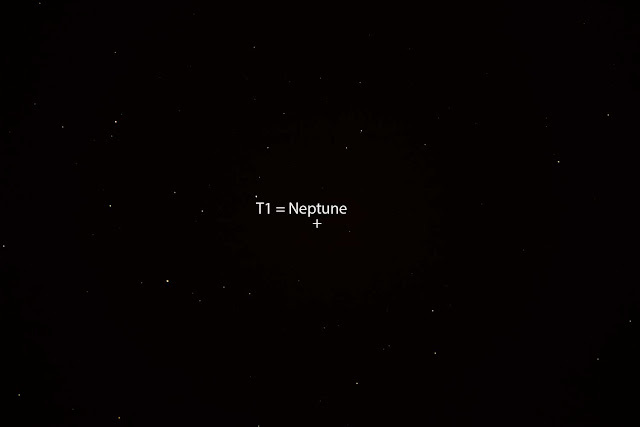 the target, which included the magnitude estimate and the RA and Dec of the target and comparison to the know RA and Dec for Neptune. 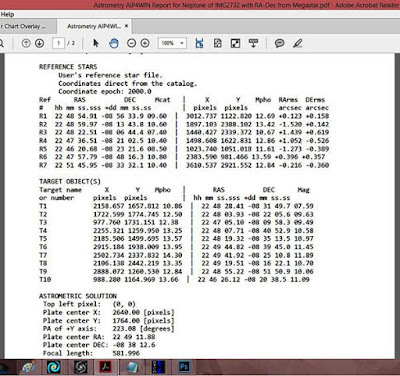 The analysis tool used for this was AiP4WIN and Megastar astronomical catalog. Starting with the published RA and Dec for Neptune, a Megastar data file showing the surrounding stars that should be in the camera field of view was generated. Then this pattern of stars was overlayed directly on top of the camera image, which takes a bit of manual effort to slide the star pattern around and rotate it so that the two images lie directly on top of each other. See below. The software knows the actual locations of all the reference stars, based on the data provided by countless professional astronomers, who have collected and published these data catalogs. The printout shows the RA and Dec and the actual pixel X and Y locations in the camera image. 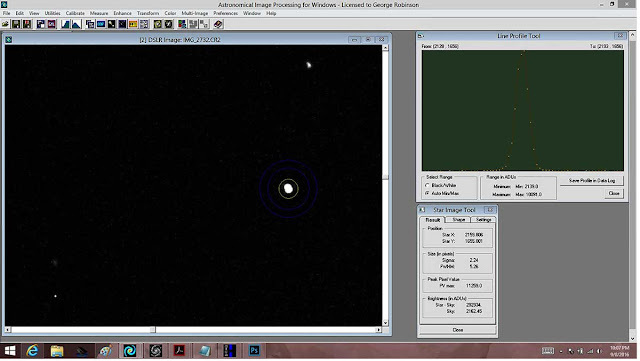 The location for Target T1 depends only on the catalog data and the accuracy of how well I initially overlayed the two images and not at all on how well my telescope was aligned or pointed or tracked the earth's rotation. So, the measured and predicted location is well within 5 arc seconds. 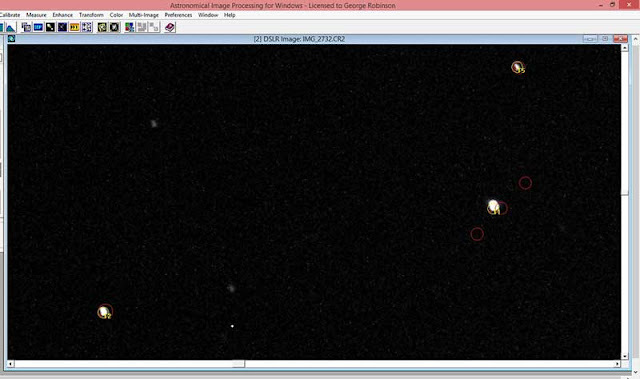 An expanded view of the previous screen shot, with the predicted location of Neptune being the middle of the three circles is shown below. See how the fuzzy image lies almost right on top of the red circle. Note too that the image was taken with a 600mm telephoto lens so not much detail, other than a fuzzy smudge is visible. I like using the 600mm lens and my smaller Ioptron AZ Mount Pro because I can carry the mount out with 1 and a third hands and set up the whole system in about 5 minutes and within another 5 minutes get the tripod level and aligned and make a couple of quick photo measurements very quickly. This is especially important at this time of the year when the coastal clouds can come in quite quickly and cloud everything out. Now, I shouldn't create the impression that all of this analysis worked perfectly the first time. Oh, no, it did not initially go well at all. I discovered that there are different values of RA and Dec that are available from different sources and they each can have slight different meaning. For instance are the RA and Dec given in the current J2000 epoch or some other epoch? Are the calibration stars being used in the analysis from the same epoch? Remember too that the planets were originally called the wanderers for good reason and this also means that their RA and Dec are continuously changing, not by much, but much more so than for stars, so you have to be careful when plotting the location of a planet. My first attempt at plotting the catalog location of Neptune used a value from my Ipad program, which just happened to be set to current epoch J2016.7, so the plotted location was almost a dozen arc minutes away from the J2000 star positions used for reference. So, it took me quite a while to resolve what was going on. See, not only do amateurs observe at night but they have to work all day too, to resolve what they did or did not do at night. Why are there only 24 hours in a day? The target profile is generated by dragging the mouse across the target, which results in the profile in the green screen at upper right. The star image tool shows the total value of light in all the pixels that make up the star image. The star image would normally be just a single pixel, but due to atmospheric seeing, mount tracking error and lens diffraction effects, the image gets blurred around a bit. Also the maximum pixel value greater than 10,000 is not desired because of nonlinear sensor response characteristics. Next time, it would be better to limit the exposure to say 20-25 seconds, rather than the 30 seconds. 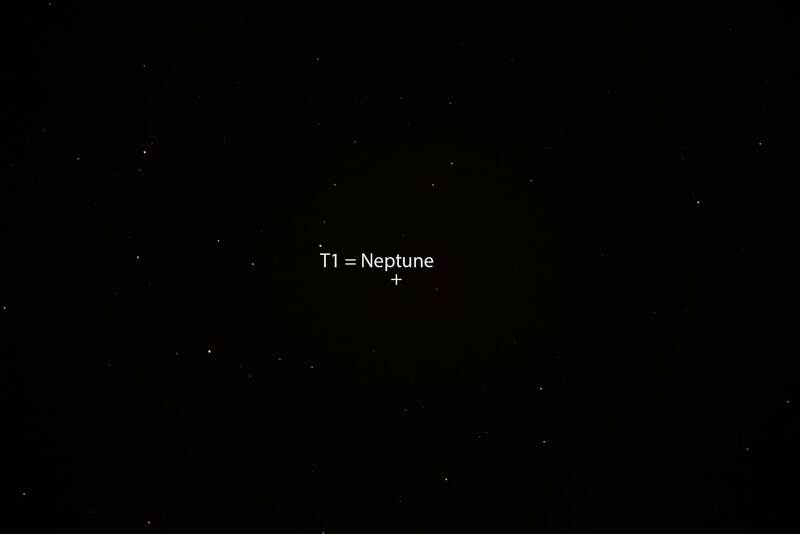 So, the final conclusion is that yes, Neptune is the target shown just above the "N" in the final image below. The frame center is shown with a "+". By the way, I should mention that I went back and found a previous post from August 9, 2015, where Resident Astronomer Peggy and I were at the star festival in Julian and at that time, I tried to get an image of Neptune. Was it really there? No, sadly it was not. 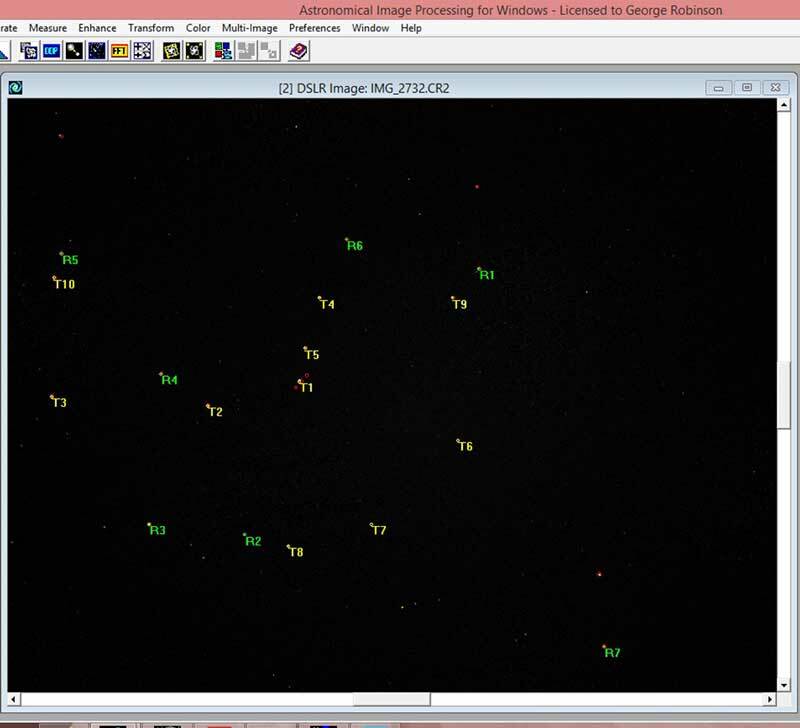 I used the same astrometry analysis tools discussed in this post and the image was off by dozens of degrees. Oh well that is what happens in amateur astronomy. Lessons learned! I used the search feature built into the blog site to search for keywords to find that original post. That is about enough for this post. Next week will be busy with the AIAA Space 2016 Conference and the physics colloquia start up again. Its always nice to be back on campus and the conference should be nice too. See you there. Also don't forget the upcoming OCA General Meeting where we will hear about the "Clash of the Titans: Andromeda and the Milky Way"